Having just spent a few days creating the audio version of this book, I’ve come to a simple, but rather obvious conclusion. Reviewers, especially the locals who opined on this masterpiece, appear to be as time-poor as the rest of us. That is the only way to explain why they so obviously skimmed rather than invested the time this book deserves. What other reason could there be for their missing out chunks of fascinating material Johnson courageously uncovers? Like the strange tale of policeman S’bu Mpisane who had the misfortune to witness his partner being gunned down in an attempted murder on the steps of Durban’s High Court. During the murder trial, Mpisane, star witness for the prosecution, simply disappeared. Without his testimony, the case collapsed against taxi boss Mandla Gcaba, a modern Al Capone. Mpisane emerged a year later suddenly fabulously rich and a newly established “businessman” given, inter alia, a R200m construction contract by the Durban Municipality. His newfound wealth includes a R17m mansion in La Lucia – and he famously exchanged Rolls Royces with his now society pages wife as Christmas presents. Johnson takes us through a similarly engrossing story of Durban’s ANC City Manager Mike Sutcliffe. This strange character, whose only credential appears to be his “struggle” background, engineered the sale of the city’s bus company Remant Alton to a gang chaired by ANC KZN Treasurer Diliza Mji (including the same taxi boss Gcaba) for R70m. Five years later, after the business had utterly failed, Sutcliffe got the City to buy it back for R405m. But even that wasn’t good enough for the plunderers of the public purse. Not long afterward, Durban contracted a Gcaba-related business to run the same bus company – paying it a staggering operating fee of R136m a month. Gcaba, Mji, Mpisane and many others whose involvement Johnson details, including the Indian Gupta, Reddy and Shaik families, serve the Zuma Empire in various ways – “business partnerships” with the President’s immediate family; donor relationships with the “Foundations” of Zuma and his various wives; and, as Johnson puts it, the abuse just goes on and on. But let me not spoil it for you. This is a masterpiece in unembellished reality. It takes time to read and digest as Johnson unravels the extensive webs of corruption. But persistence by the author – and the reader – rewards us with an understanding of a pillaging structure resembling a feudalistic medieval European King, his Barons and lesser nobles, all bound together in thievery. The book takes a sustained swipe at political correctness, using a virtual loud-hailer to broadcast truths otherwise only whispered in quiet places. Johnson pulls together the strands and joins the dots of ANC misrule of the once dynamic South African economy. Except that the author disputes that assertion too, concluding the nation’s economic troubles are not the result of mis-rule, but rather no-rule. The rational conclusion from facts uncovered by his meticulous research is to appreciate where the country is likely headed. And it is not a pretty picture. But before delving into that morass, first some insights into the author. An anti-apartheid activist, RW Johnson arrived at Oxford University in 1964 as a Rhodes Scholar. He stayed on at the university, as the best are sometimes invited to do, teaching politics and sociology as an Emeritus Fellow (“don”). When Nelson Mandela was released from jail, he returned home to South Africa to “see how it all worked out.” https://youtu.be/LD2_revkytY The cover of his book informs us Johnson’s former students include three members of the current British Government’s cabinet, an editor of The Economist (he liked sending his stars there) “and a large number of leading academics and journalists.” In 1977, Johnson had his first run at How long will South Africa survive? That book came to a then unpopular conclusion the Apartheid regime would only last until the mid-1990s. The first chapter of his new book with the same title revisits this earlier work. Primarily to explain how it was the withdrawal of Western Capital, not any glorious “armed struggle”, that brought an end to Apartheid. Such myth busting runs consistently throughout the updated work. This is not a book to dip in and out of. Doing so removes the power of its message. Johnson, a historian, political scientist and journalist, would have made a magnificent barrister. Using facts and personal experiences, he slowly and carefully builds the case that leads the rational to conclude it is a nation hijacked by corruption and outdated political dogma, by expediency and naivety. At no time does courage desert this 72 year old self-described “optimist” who is lucky to be alive. Six years ago, while walking to shore after a swim, Johnson cut his foot on a rock in the Mpenjati Lagoon on the KZN South Coast. Were it not for the swift reaction of a Port Edward GP and a Margate surgeon, he would have lost a lot more than a leg to the flesh-eating bacteria which thrive in the lagoon, courtesy of upstream dumping of faeces. The theme of this classic, in a nutshell, is of a greedy and economically illiterate elite who, flushed with power, dispense largesse via unsustainable wage hikes to public sector employees and continuously expanding social grants. This ignorant abuse of the public purse has created a financial crisis. One exaggerated by the elite’s idiotic flogging of its funders through anti-business dogma coming from a mindset inherited during their indoctrination in the old Soviet Union. The consequence is a State with ever-growing costs on the one side of the income statement. And on the other, a contraction of economic capacity compounded through a capital strike by Corporate South Africa. To unpack the story any more would be following in the footsteps of those superficial reviewers. This is a book to be savoured, slowly digested and mulled over. Sensible decisions can only be made when you possess the full arsenal of facts. There is all you will ever need in these 246 pages. If you have any interest in the future of South Africa, I urge you to join the tens of thousands who have bought the book. Were you among them and stopped part of the way, pick it up again. Or even easier, buy your copy of our instantly downloadable audio book and let me read for you while you drive to work or relax over the weekend. Were South African a nation which placed a greater value on books and learning, the contents of Johnson’s inimitable work would literally be revolutionary. That is a forlorn hope. But it doesn’t prevent each of us using his treatise to understand the reality of this country and be far better informed as we watch the future unfold. 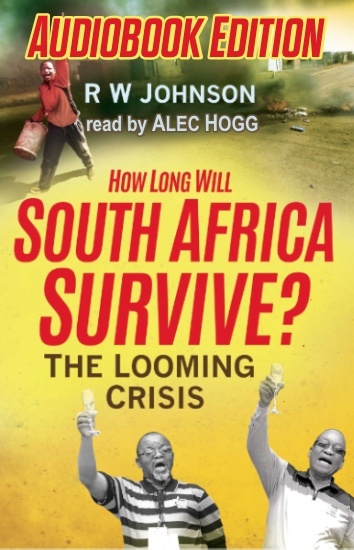 Biznews owns the global audio rights to RW Johnson’s How Long Will South Africa Survive? It is read by Alec Hogg, who started business radio in the country and for over a decade and a half presented a prime time show created for SAFM, 702 and Classic FM. His interviews are now done in the form of Podcasts for Biznews.com.